You thought I was in the U.S., didn’t you? I got a very late start this morning because it was “laundry day”. With only three changes of clothes, I need to take advantage of whenever I find a “washateria”. I’ve discovered that wearing the same set of clothes for multiple days guarantees you will be riding and eating alone. With the warmer weather, my gear has become quite rank. Once I got going, I made it only seven miles before stopping at a taqueria in Hunt for a bit of lunch. Then at the suggestion of a friend I took a detour onto Hwy 1340 and visited one of the stranger sights I’ve seen. 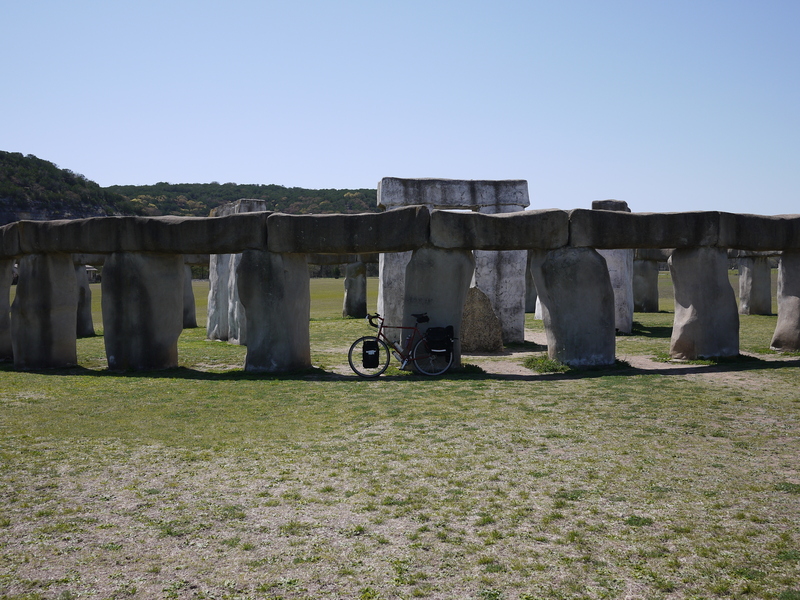 In 1999, a couple of ranchers, Al Shepperd and Doug Hill, on a lark, decided to make a replica of Stonehenge on a 2/3 scale. It’s really quite strange. 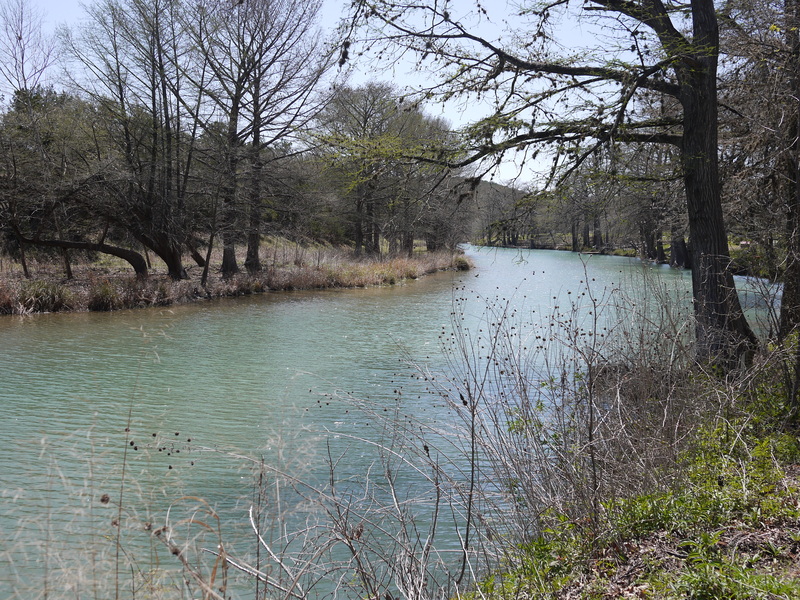 You cross over the Guadalupe River, climb past some small ranches and there in a large open field you see it. The monoliths are steel and concrete, not stone as in the original, but it’s a realistic replica. Clearly, Al and Doug had way too much time on their hands. Reversing course, I again rode through Hunt and for the next twenty miles crossed back and forth over the Guadalupe. It’s a lovely area with many expensive homes, ranches and lodges lining the river. Boot Hill Ranch has an obvious way of making itself known. 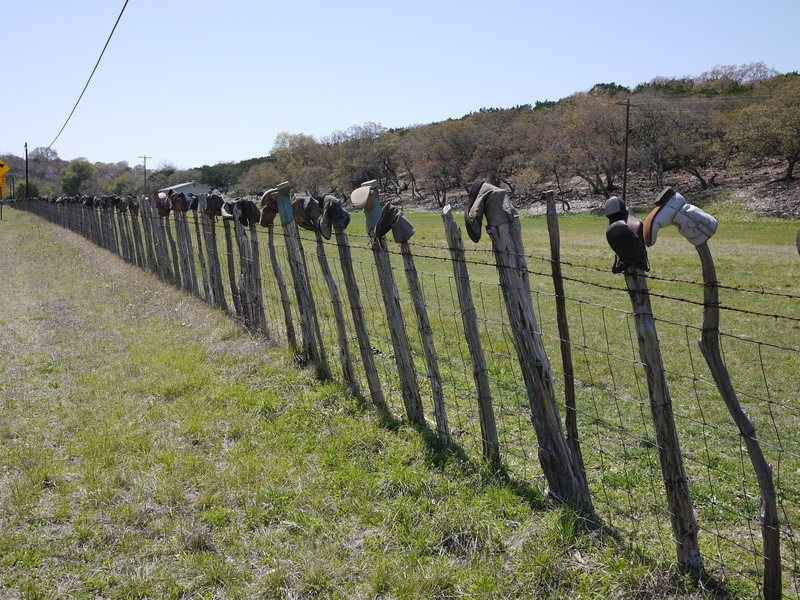 Every post for over a quarter mile in front of the ranch is topped with an old boot. There are hundreds of them in every size, color and style you can imagine. 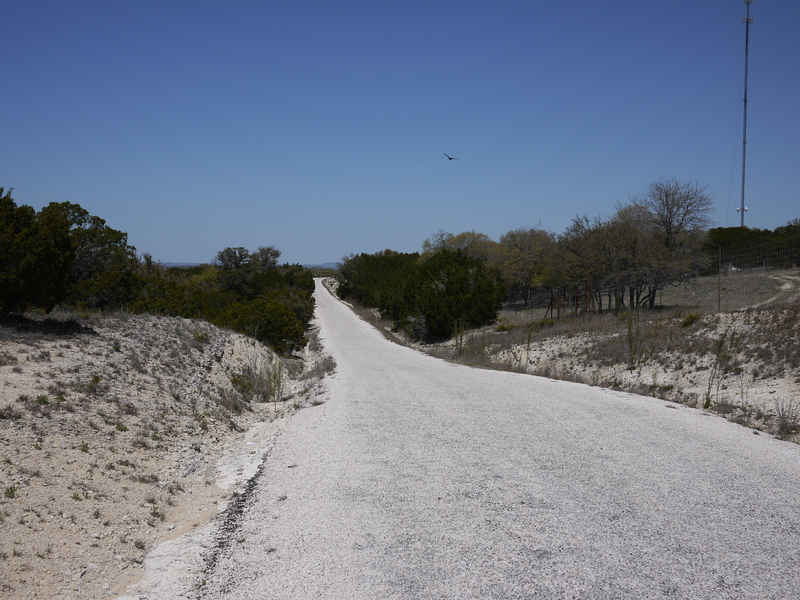 The next 40 miles were a succession of rolling hills in a very desolate part of Kerr County. The scenery was, like yesterday, incredibly beautiful and I had a day to match. Nothing but clear skies and warm temperatures. I rode in a t-shirt and let the heat saturate my bones. Along the way, I saw my first Geococcyx Californianus. It was much larger than I had expected and it took me a few minutes to identify. I also saw a camel and what I believe was a herd of African Impala. I never found out the story about the former, it was just eating some straw in someone’s front yard. As to the impalas, it turns out that some of the ranches in the area have converted from raising cattle to raising exotic animals for hunting. As I climbed higher the scenery was even more appealing. 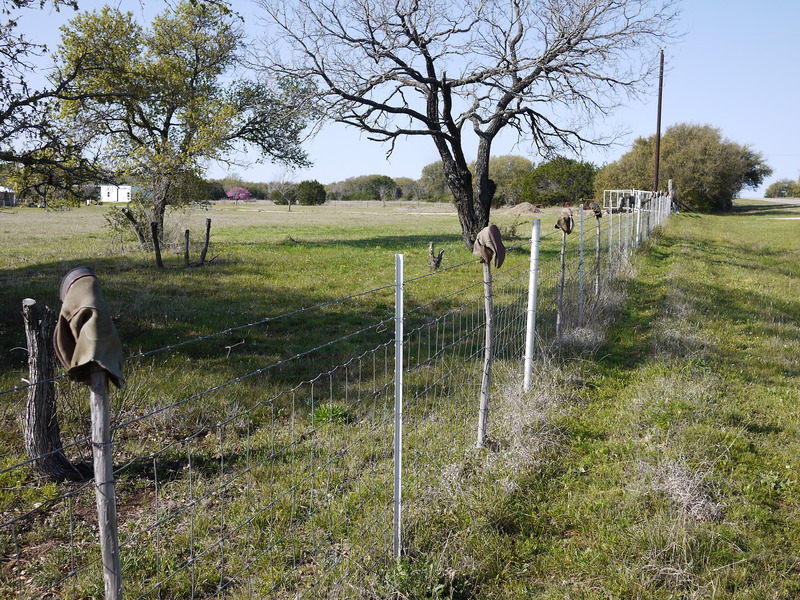 Mats of prickly pear covered the landscape along with yellow Texas primrose and oaks just starting to leaf. I had the road all to myself for hours at a time. As the sun started its move west, I rode down the centerline focusing on the shadow of my pedals on the pavement and listening to Miles Davis. It was bliss. At around 5:30, I rolled into Lost Maple State Park. 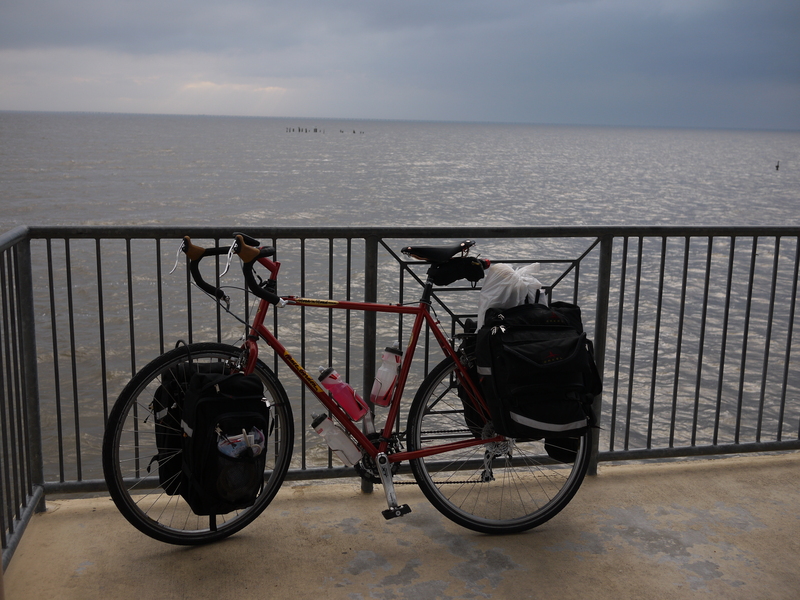 I rode around looking at the campsites (which were nice), but I just didn’t feel like stopping. 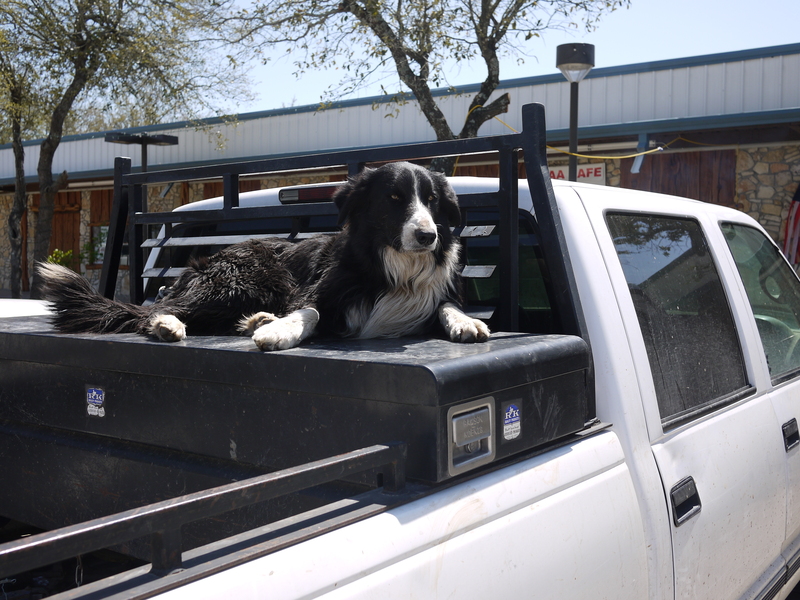 A few miles down the road, I pulled over at the local market in Vanderpool. I saw a fully loaded touring bike out front and went inside and met the owner, a gentleman who is riding the southern tier from the west coast. We compared notes and he advised me against going any further today, because of the hills between Vanderpool and Leakey (known as the “Alps of Texas”). Despite his recommendation, I couldn’t bear the thought of riding back to the state park. (I’m fairly certain that in its original Gaelic, my last name means either “never ask for directions” or “never backtrack”). Anyway, I figured that once the sun set the headwinds would abate and I would have sufficient light because of the full moon. A few miles outside of Vanderpool, I hit the first climb. It was an 11% grade for one to two miles with only one slight bend. Nasty. This was followed a few miles later by a second climb of about three miles and a 9% grade and then a last short climb with a 10% grade. All this in the final 15 miles. The downhills were equally daunting. I discovered that terminal velocity for my bike fully loaded is 35mph. Or, perhaps, that is terminal velocity for my courage, because once I hit that speed, I was crushing the break levers. With all my weight, I felt like an out of control 18-wheeler. But despite all this, the area grew even more beautiful with the setting sun. The angle of the light brought texture, color, dimension and grace to what surrounded me. I brought my bike to a final stop in Leakey just as the first stars appeared overhead. Got an early start for a change and headed out of Johnson City by 9am. About 10 miles west of the city, I rode past a neglected home that looked like it had been built more than a century ago. From its porch, I heard the high-pitched yelp of an angry dog. My adrenal glands opened immediately and flooded my body. As I got ready to pump I looked over my shoulder at my pursuer. What I saw was the most pathetic member of the canine family I have ever seen. This dog was an obese mongrel about the size of a cantaloupe. He was missing large patches of fur along his sides and had one ear that appeared to have been chewed off. In addition to these the deficiencies, the poor guy had only three legs. But, he was committed to doing his job. Sizing up my opponent, I decided to slow down and let this former warrior have one last day in the sun. I rode at a pace that was so slow I had difficulty keeping balanced. Eventually the dog hopped within striking distance of my foot. At that point, I feigned surprised and pedaled away furiously. It’s a dog karma thing. 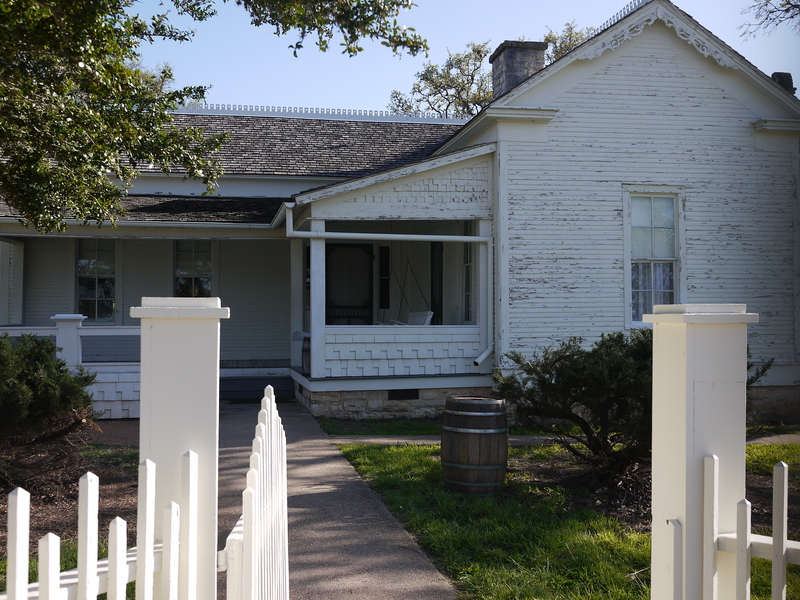 From Johnson City, I followed Hwy 290 to Stonewall and past the Johnson Ranch, which is where LBJ and Lady Bird retired after his years in the Oval Office. A few miles later, I saw two backpackers on the opposite site of the road hiking west. I pulled across the highway and walked with them for a while. 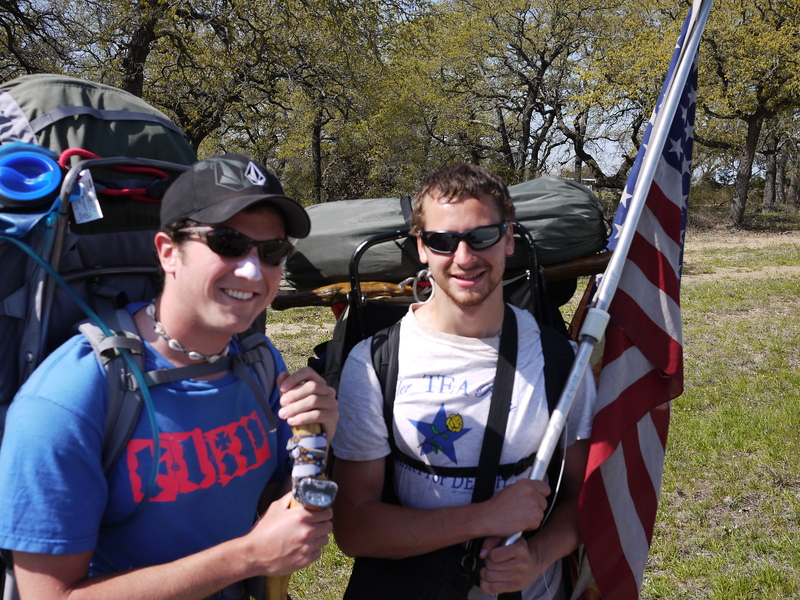 Matt and Mike are hiking across the U.S. Matt started in New York and Mike joined him in Louisiana. You can read Mike’s blog here. Back on my bike after spending time with them, I determined that I will not complain about my pace anymore. These guys still have another three to four months before they get to Santa Monica. The ride toward Fredricksburg wove through peach orchards. Signs everywhere advertised fresh peaches, peach pie, peach ice cream and peach jam. Of course, I’m too early in the season to enjoy these and am now craving the fruit. 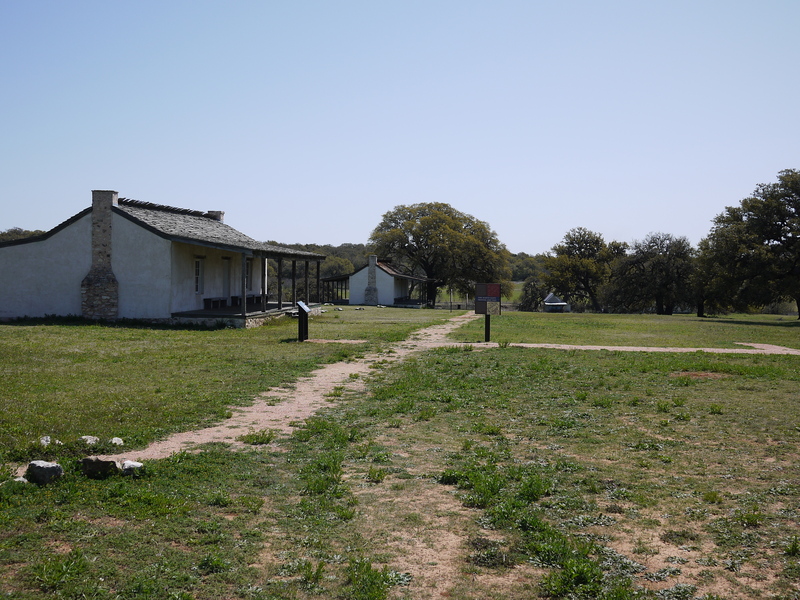 I crossed over the Pedernales River and stopped briefly at Ft. Martin Scott. 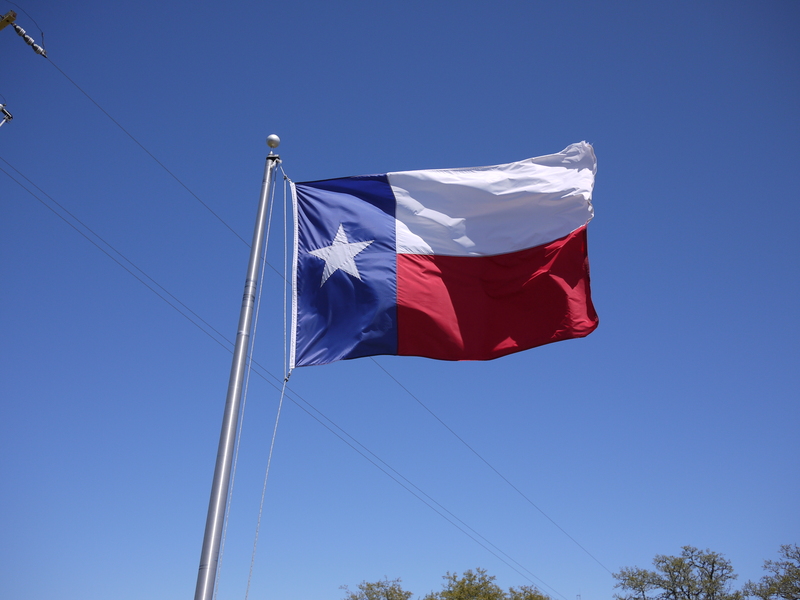 This was one of a series of outposts built in the 1840s to protect Texas citizens against Comanche raids. General James Longstreet was one of the Commanders of this small base. Later he rose to fame in the Civil War fighting under Gen. Robert E. Lee at the battle of Gettysburg. In Fredericksburg I had a great lunch at an outdoor cafe. It’s a large community founded by Germans more than 150 years ago. The town takes pride in its Germanic roots, you see it in the food served at restaurants and at the various celebrations they have throughout the year. The main street on either side of Hwy 290 has many beautiful restored buildings with interesting restaurants, art galleries, antique shops and boutiques. Quite different than the towns I’ve seen to date on this trip. After lunch I stopped at Hill Country Bikes for some tire irons (I broke mine). The owner suggested an alternative route that avoided the major highways. She said that it was one of the most beautiful road rides in the country. After following it this afternoon, I would have to agree. 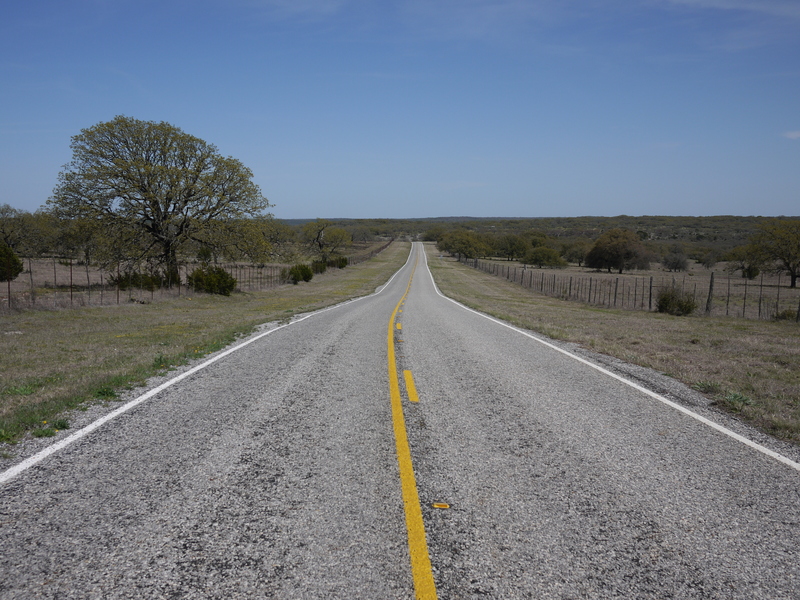 The route wound through rolling hills with cattle ranches on both sides and the wonderful spring Hill Country landscape everywhere. The best part was that there was almost no traffic. During my three hours on this part of the ride, I saw only one truck. Around 6:30pm, I rolled into the “By the River RV and Campground” in Ingram. What a find. For $9 it has hot showers, WiFi and washing machines. Best of all, the RVs are all in a parking lot on one side of the river. Tent campers cross a bridge and camp on a large multi-acre island. Tonight I have it all to myself and will be sleeping under the stars. Oh, and in case you’re jealous with the thought that I might be enjoying some wonderful Texan cuisine, this evening’s dinner will be a bowl of Top Ramen and a Lone Star beer. Austin is a very difficult city to leave. The food, music and art are captivating. The Green Mesquite BBQ sauce exuding from my pores throughout today’s ride was a reminder of how much I enjoyed exploring the place. I even grew to appreciate the Grackles with their cacophony of calls in the early evening. But, the best part of the week was spending time with the girls. It feels like I’ve been gone for years, rather than just a month. I expect that my iPod will be playing mournful cowboy songs the next few days as I grapple with loneliness. Before getting on the road this morning, I swapped out my tires for a fresh set that should hold me until I get home. I also repacked my gear and gave some of it to WCC to take back so that I could lighten my load. Yet, despite my preparations, it was tough day. After five days off, my body clearly had convinced itself that we were done with this cross-country jaunt and voiced its displeasure through various aches and creaking sounds from my joints. For most of the ride, the views were of wealthy suburbs of Austin. Near Henly, the beauty of the Hill Country began to reveal itself. Wildflowers, oak trees and switchgrass filled the scenery along with white dirt ranch roads disappearing into the mesquite brush. Spring here is something special. Only one thing marred the day – headwinds. They began as I left Austin and picked up in velocity in the afternoon. By the time I reached Johnson City, my tank was empty. I checked into the first hotel I found, showered and went for a walk downtown. 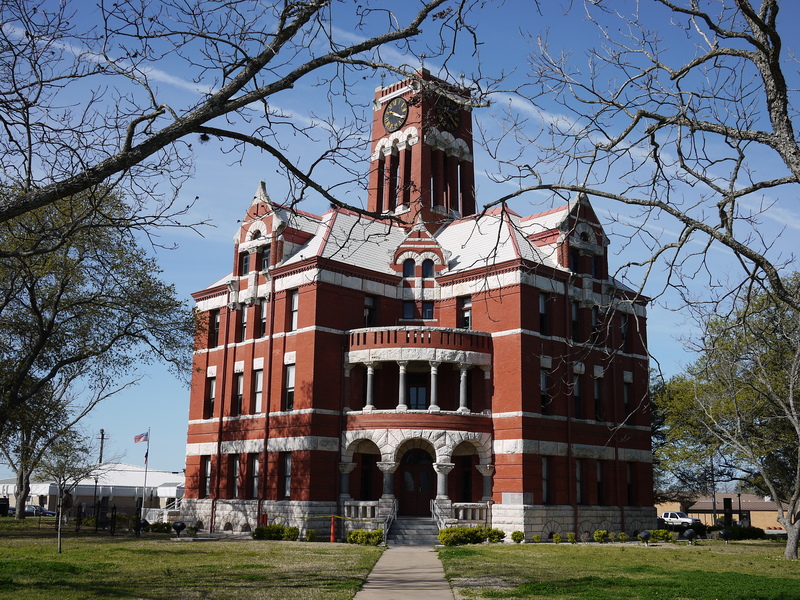 This small town with a population of less than 1,200 people is the birthplace of LBJ. On the porch of this home, our 36th president launched his senatorial and presidential campaigns. Yards away from this house I saw the headquarters of Pedernales Electrical Cooperative. It was a subtle reminder of one of President Johnson’s most significant legislative efforts. In his series, The Years of Lyndon Johnson, author Robert Caro provides a moving account of what life was like in the Hill Country before electrification, especially for women responsible for households. Among all of his accomplishments, President Johnson considered bringing electricity to the Hill Country one of the most important. These is the second part of my post from yesterday. Bike: I could not be happier with the Bruce Gordon Rock n’ Road. Not a single problem. The gearing has been exactly what I’ve needed for both flats and challenging climbs. Entering Austin, I had a climb with a 20% grade (thankfully, it was short). I had no problem getting up it and with a few gears to spare. I even like the rooster decal on the headset. It gives me something on which to focus when riding into a nasty headwind. Bottom line: worth every dollar. 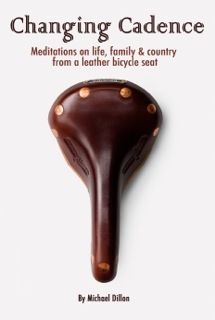 Saddle: Once broken in, the B-17 has become the most comfortable saddle I’ve every used. After more than a 1,000 miles it fits me well. Any issues I have had are the result of a lack of riding lube, not the seat. Tires: If Schwable made automobile tires, I’d buy a set for every car. They ride well and are almost impervious to the debris found on southern roadways. They are also very easy to get on and off. I thought the white walls looked a bit strange when I first saw them; however, it turns out that they are highly reflective providing additional visibility at night. Panniers: Again, no complaints, only praise. The Arkels are easy to get on and off the bike, but are secure enough that they don’t rattle despite the most abusive roads. The pockets provide ample room for stowing gear with easy access for frequently needed items (sunscreen, glasses, wallet, etc.). In hindsight, I should have also purchased the waterproof covers, but trash bags have worked fine as a substitute. Stove: Here’s the biggest issue with the Jet Boil. It heats too quickly. I’ve been using a Whisperlight for more than a decade and am mentally programmed to how long it takes to boil water. The Jet Boil is so much more efficient, that I am constantly over boiling things. It’s a nice problem to have. Additionally, the lesser weight and smaller size make it ideal for touring. Cycling pants: I brought three sets, but have been riding most often in my wool knickers from Swobo. The wool is more comfortable than the synthetic fabric of most shorts. I also like protection of the having my knees covered. When you are kneeling on the pavement to change a tire, the padding is welcome. Back on the road tomorrow. Unless, I can convince WCC to move to Austin. Note: For those of you not interested in cycling, you may way want to skip the next couple of posts. Still here, enjoying Austin for a few more days. 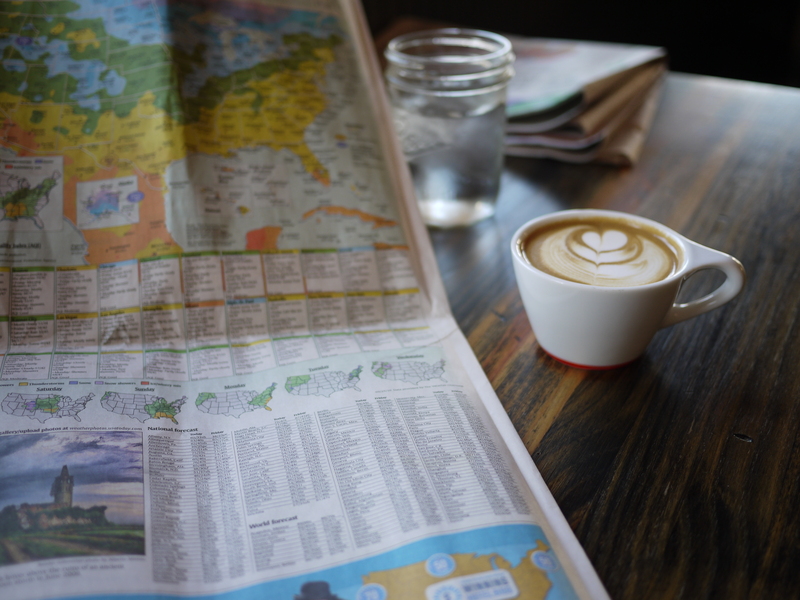 Over my cup o’ joe this morning, I thought I’d try to help others who might be considering a ride by sharing some of the things I’ve learned so far. I’ll break it down into two posts, non-mechanical and mechanical. 1. Don’t be a slave to (bike) fashion. When you begin cycling as a recreational rider, it’s normal to avoid traditional clothing like spandex riding shorts and tight fitting jerseys. It feels silly at first. But, as you transition to more serious riding, you begin to understand that there are good reasons for this type of clothing – avoidance of chaffing, reduction of wind resistance and comfort among them. However, when you are riding through small rural towns that don’t have a culture of cycling, you need to be aware of how strange (and possibly offensive) your attire looks. A few weeks ago, I stopped in a crowded little grocery store in Mississippi. I walked to the counter in my full biking regalia – helmet, multicolored jersey, tight black shorts, funky biking socks – and asked if they had any Desitin. The clerk took a long look in my direction. After an awkward few silent moments, I looked over my shoulder to see behind me three or four large men – think size 18 neck, minimum – giving me the “you’re not from around here, are ya?” stare. Then, it dawned on me that to these hard working farmers and ranchers the idea of recreational cycling was as alien as a gym membership and my clothes made matters worse. Since then, I’ve learned to carry long pants and a lose fitting shirt in my front panniers. Whenever I stop, I throw those over my bike gear before I enter anywhere. 2. Read the landscape. It’s getting dark. You’ve put in a long day and are trying to determine whether you are close to the town that is your destination. The first thing to look for is a water tower. Many small towns still rely on them and in flat areas they can be seen for several miles. Other things to look for are cemeteries and salvage yards. These are generally located on the far outskirts of town. When you see them, you know you are getting close. Regrettably, you can often determine what commercial establishments are in a town by looking at the trash on the side of the road. A Walmart bag, Starbucks cup or McDonald’s wrapper give you an idea of what is ahead. 3. Do your homework. For the most part, I’ve been using the ACA maps. They’re well done, easy to understand and thorough. But, they only provide a narrow view of the few miles on either side of the suggested route. So, purchase a state map. It will help you find alternative routes and places to visit or camp that the ACA map may not include. Also, the crazyguyonabike website contains journals from others touring the US and abroad. Sometimes you can find someone who is riding the route a few days ahead of you and glean helpful information by reading their blogs. 4. WiFi is nearly ubiquitous. Just as the adult entertainment industry is largely responsible for richer web interfaces, you can thank long-haul truckers and snowbirds in RVs for driving adoption of WiFi around the United States. I’ve been surprised that even the smallest hotel, RV park and even some state campgrounds now have WiFi access. (Annoyingly, the more expensive the hotel, the more likely you will be charged for access.) This increased connectivity allows you to research what is ahead on your journey (see no. 3 above). 5. Use multiple sources. If you were asked to provide directions to the nearest hotel or campground, could you do it? Probably, not. Yet, for some reason, when you cycle through smaller towns you expect everyone to know this information. The reality is that you don’t use these types of lodging in the place where you live – why would you need to? But, people still want to help and often will guess when giving information. As a result, when you ask for directions, ask multiple people. There is nothing more frustrating than being at the end of a long, tiring ride and given incorrect directions that cause you to unnecessarily ride another five or ten miles. 6. Eat at the bar. If you are riding solo, sitting alone in a restaurant feels awkward and isolating. People are reluctant to approach when you are at a table by yourself. Instead, I’ve found that the best thing to do is to ask for a menu and sit at the bar. You can converse with the bartender – a great source of local knowledge – and possibly get the opportunity to meet with the locals. 7. Wave to everyone. Many of us go through life not wanting to bother others. That’s fine, but a wave is a simple gesture that indicates that you are receptive to connecting. While riding through Louisiana, I saw an older man sitting on his porch looking at me with a stern glaze. I gave him a slight wave and for a few seconds he didn’t respond. Then he gestured to me to ride over to him. I did and he ended up warning me about some heavy road construction and suggesting an alternative route. Aside from these types of benefits, it’s good to be an ambassador for other cyclists. Let me begin with the worst part of being in Austin. Everyone I talk to, whether a clerk, bike mechanic, bartender or barber, says the same thing: “Oh, man, you should have been here last week for SXSW.” I want to respond by “dropping trou” and showing the calluses on my derriere with the explanation that I could not have pedaled much faster. But even this can’t diminish my enthusiasm for Austin. This place is great. I woke up this morning and rode down to 4th and Nueces to Mello Johnny’s. Before entering, I genuflected and said a silent prayer for an 8th win in July. Jason, the mechanic on duty, told me they were booked with service orders for the week, but after I explained my ride, he said he thought he could get my work done in the next couple of days. Aside from the Lance connection, this is a great bike shop. It has lockers and showers for commuters, a broad array of products, and an excellent coffee shop, all on the premises. From there, I walked to SoCo (South of Congress) passing the decommissioned Seaholm power plant. 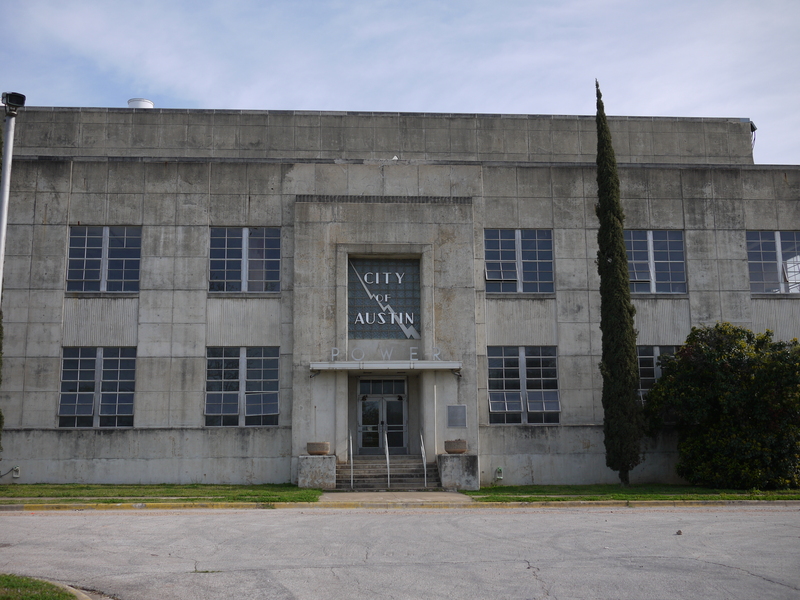 Built immediately after WWII, this facility provided power for all of Austin’s electrical needs. Although it is no longer active, I was struck by the architecture and the graphics of the signage with “Austin Power” and a thunderbolt in an Art Deco font. Hopefully, it will be a building that the city chooses to renovate and preserve. SoCo is just “cool”. There is no other way to put it. Interesting and eclectic shops ( Uncommon Objects stands out) and tempting food are everywhere. 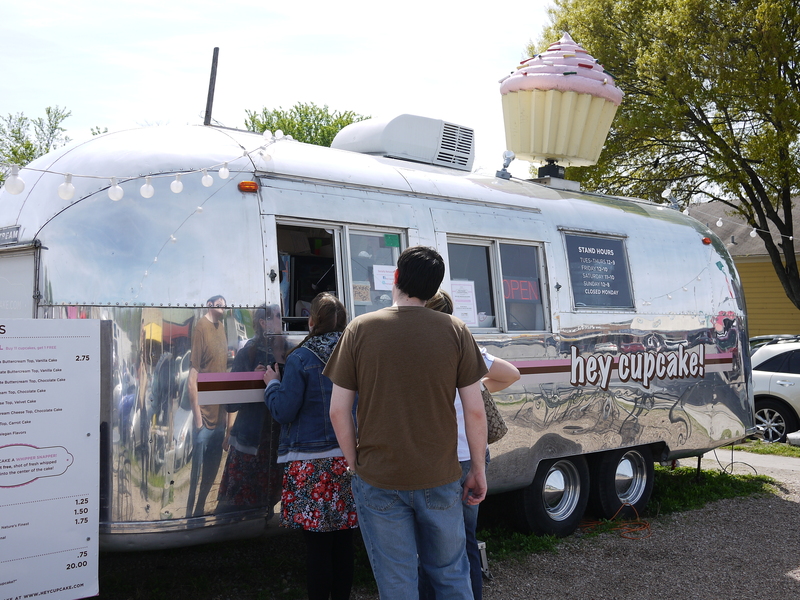 Special to Austin are restored Airstream trailers that are used to serve food – BBQ, Mexican, Indian and even cupcakes. The quality of what I tasted was outstanding and I never tire of looking at Airstreams – an iconic bit of Americana. When I travel, I’ve learned that a good way to get an inside view on what’s happening is to visit a barbershop. 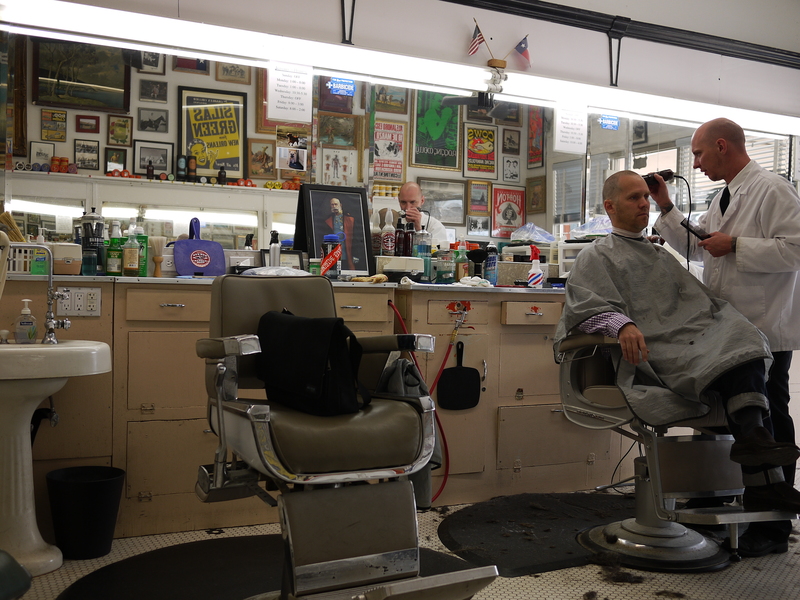 In SoCo, I found Avenue Barbers (since 1933). The décor feels as if you stepped into the 1940s or 50s and the barbers, dressed in white coats, provide an “old school” cut complete with straight edge, hot foam and powdered brushes. What’s striking, however, is that they are not septuagenarians, but tattooed 20-30 year olds who aim to provide barbering services as have been done in this shop for the last 70 years. 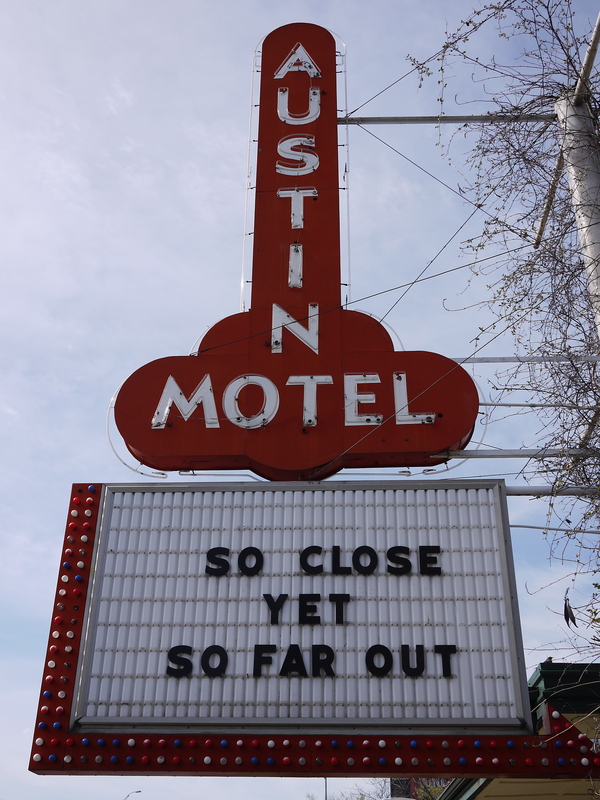 I walked past the Austin Hotel, a family-lodging establishment and long time Austin institution. Is it just me, or does anyone else think their sign is highly suggestive? There are many signs around the city proclaiming “Keep Austin Weird”. You get a sense for the place also from establishments like the Magnolia Café with it’s billboard that says: “Sorry, we’re open” or Little Woodrow’s bar that advertises: “Come early, stay late and remember nothing.” It’s clear that this is a city that doesn’t take itself too seriously. It’s also a place in which all forms of art are integrated into the community. Around every corner you see a mural or sculpture; buildings are restored to carry forward interesting architecture from decades past; music is everywhere and there is an amazing diversity of food on every block. Portland, Santa Fe and San Francisco are other places that imbue this fusion of aesthetic and community. The question is – why doesn’t every city? Austin also has an excellent independent bookshop: Book People. Wherever I journey, I seek out the local bookstores. You can divine much about a community by what it reads. Book People is a good example. Their selection covers books I haven’t seen elsewhere, with extensive collections by Texas authors and on local history. I walked away with a stack of books knowing that only a few would fit in my panniers. The highlight for me today (other than a tasty BBQ dinner at Stubbs) occurred at dusk. I walked to the southern edge of the Congress Avenue Bridge with a few dozen other people and waited for the sun to set. At around 7:30pm a stream of Mexican free-tail bats flew out from under the bridge looking like a dark shoelace winding across the twilight sky. There were tens of thousands this evening, but later in the summer the population grows to more than one million. 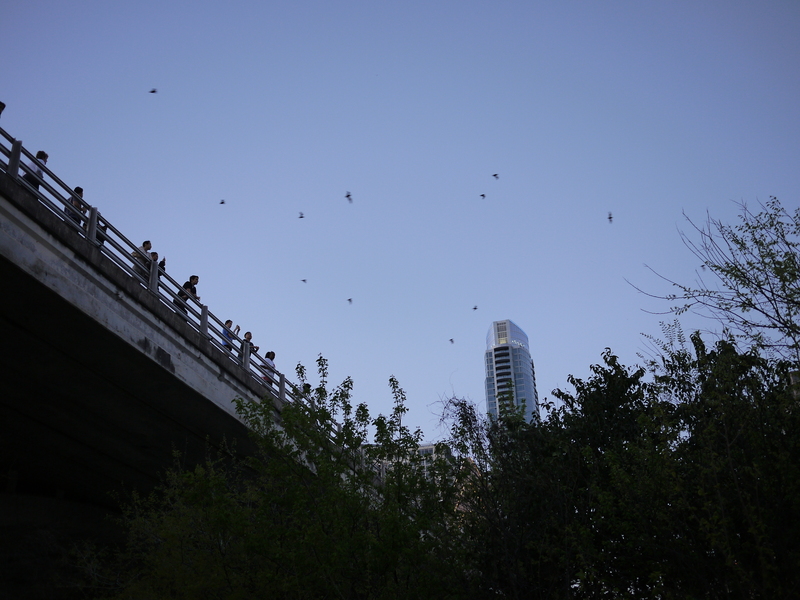 A bit of trivia: these bats consume between 10,000 and 30,000 lbs of insects each evening from the Austin skies. On my return to the hotel, Eva Longoria called and asked if I wanted to go out to hear a band at Antoine’s. I told her we’d need to wait for another night. I’ve done enough for today. It’s amazing what 10 hours of sleep and a windless, sunny, 70 degree day will do for one’s disposition. The ride in from Giddings today was uneventful. 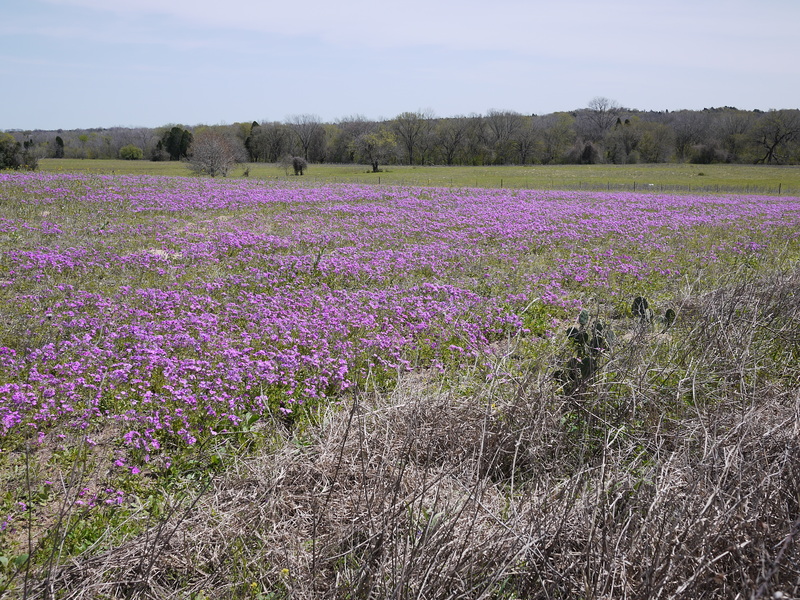 Rolling through Page, Butler and Elgin there were carpets of wildflowers – Bluebonnets, Texas Paintbrush and Square-Bud Primrose – on south facing hillsides energized by the sun. Raptors were everywhere. I don’t think I’ve ever seen so many in one day. Diving across the roadway were a large number of Red-tailed, Red-shouldered and Swainson’s hawks and others I couldn’t identify. In one area, I counted 17 Black vultures around the base of a large oak. They looked up as I rode by, but thankfully didn’t follow. As I passed Elgin and moved closer to Austin, the landscape changed. I started to see the occasional oil derrick in the middle of a cattle grazing area. The number of commercial establishments increased as it does when you approach any urban center. Fast food restaurants, gas stations, automotive repair shops, tractor sales lots, and junk yards became more frequent. But, I didn’t care because it meant that I was finally in Austin. 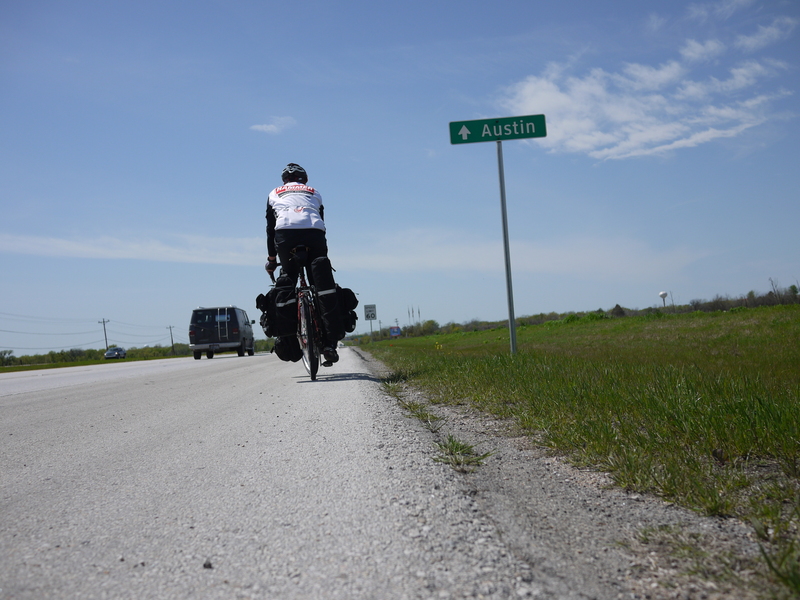 When I planned the first part of this ride, I set as a goal to reach Austin by March 25th. My daughter’s swim team has a competition here on that date (Go Big Red!). As a consequence, W.C.C. will be moving her base of operations here for the meet. I can’t wait to see my two favorite girls. 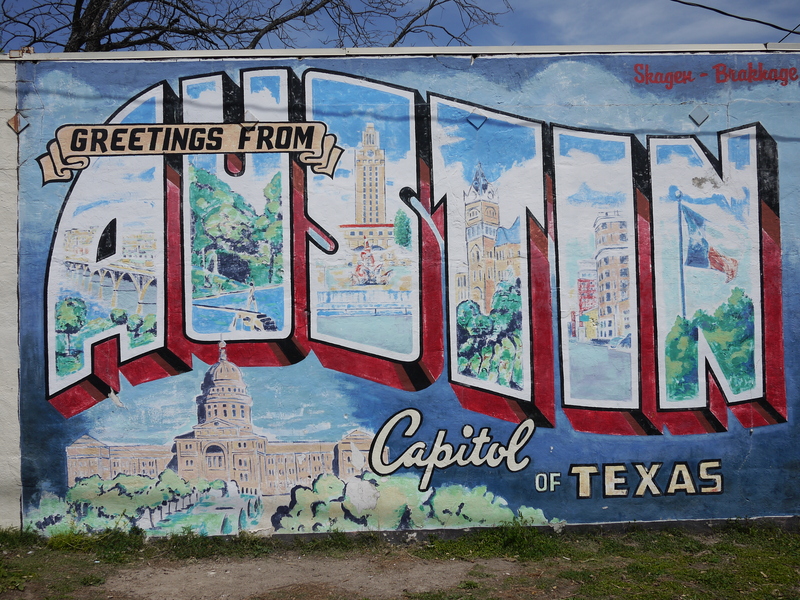 I’m also looking forward to exploring Austin, a city recommended to me by many. I’ve already mapped out a week’s worth of things I want to see in the next two days. Tomorrow, I plan to start the day by paying homage to the Patron Saint of All Things Velo. He has a bike shop in Austin and I will be bringing in my rig in for new brakes, chain and to get the wheels trued. I wonder if I can remember how to walk. I work at Adobe, but some of what I write on this site represent my own views and opinions and not those of Adobe.